Other studies indicate the systolic blood pressure (top number) is elevated during exercise and after exercise for about 2 hours. 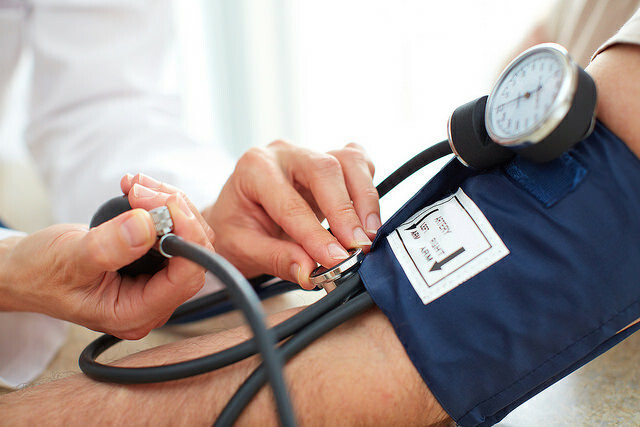 After the 2 hour mark the blood pressure tends to stay lower for 1 to 3 days. (3,4) After 3 days the effects of exercise tends to diminish. Because of the diminished effect, experts agree that moderate aerobic exercise on most days of the week is important to maximize the benefits for blood pressure reduction. Does type and volume of exercise impact blood pressure? A recent review paper found that endurance trained athletes have a lower blood pressure compared to strength based athletes. (5) The National Runners’ Health Study , a cross-sectional study conducted in 1997 concluded that runners averaging 50 miles per week or more had slightly lower blood pressures levels than those running less than 50 miles per week and that running in general lowered blood pressure. (6) This type of study design shows correlation but does not prove causation. For now, the most recent data suggest that moderate amount of aerobic exercise (including running) is beneficial for blood pressure health. Looking to optimize your performance for your next race? We specialize in biomarker analysis aimed directly towards improving athletic performance. Learn more about our panels here. Vasan RS, B. A. S. S. L. M. K. W. D. R. L. D. Residual lifetime risk for developing hypertension in middle-aged women and men: The Framingham Heart Study. JAMA.,2002 Feb 27;287(8):1003-10. Ruivo JA, Alcantara P. Hypertension and exercise. Rev Port Cardiol.2012 Feb;31(2):151-8. doi: 10.1016/j.repc.2011.12.012. Epub 2012 Jan 10. Whelton SP, Chin A, Xin X, He J. Effect of aerobic exercise on blood pressure: a meta-analysis of randomized, controlled trials. Ann Intern Med. 2002 Apr 2;136(7):493-503. Williams PT,Relationship of Distance Run per Week to Coronary Heart Disease Risk Factors in 8283 Male Runners The National Runners’ Health Study, Arch Intern Med. 1997 Jan 27; 157(2): 191–198.